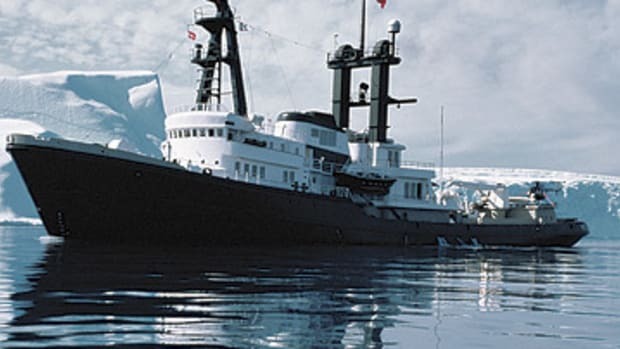 #7: LONE RANGER—255'0"Forty-eight million dollars will get you this converted icebreaking tug, which has a 31,000-mile range. That puts far-flung corners of the globe within easier reach compared to traditional yachts. Her 43'6'' beam ensures plenty of space to relax and stow toys; in fact, she’s carried a 40-footer since her conversion in 1994. #20: ARCTIC P—288’7”Sixty-eight-year-old Australian media baron Kerry Packer, who owned this converted commercial craft for a little more than a decade, died last December. Hundreds of people, including several titans of business from around the world, attended his funeral, and some people, such as British financier Joe Lewis, were put up on the yacht.